Some books just have the ability to speak to you. They get you to think, to reflect on a certain message, and even to change the way you’ve always perceived your everyday life. Like Struggle to the Summit—our newest, true medical drama. 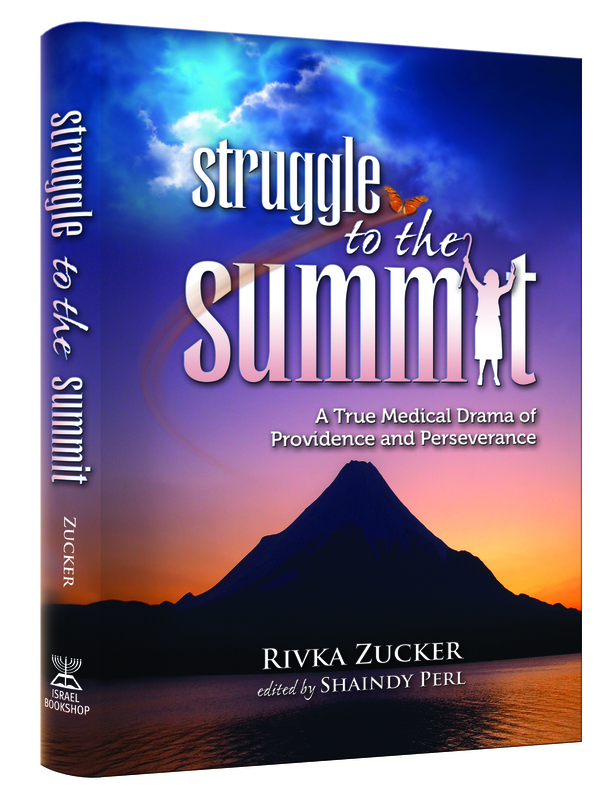 Brimming with faith and inspiration, Struggle to the Summit tells the story of Rivka Zucker, a young thirty-year-old wife and mother, who suddenly began experiencing unusual and frightening symptoms. Upon receiving a threatening diagnosis, she immediately underwent a delicate and extremely dangerous surgery in order to stay alive. Although the surgery itself was successful, that was only the beginning of Rivka’s journey. She had lost many of her most basic skills and human capabilities and had to relearn them all from scratch. Add to the equation the fact that she could not possibly mother her children in such a state, and it would be perfectly understandable if Rivka would have completely fallen apart. But she didn’t fall apart! Through the numerous ups and downs—and there were many more “downs” than “ups,” at least in the beginning stages—Rivka persevered. Her many therapies were excruciating as they were humiliating, yet she refused to give up, pining for her long-awaited, coveted goal of having a normal, ordinary day as a wife and mother once again. If you’re looking for a good medical drama that will both grip you and inspire you, this is the book. When you finish reading Struggle to the Summit, you will have an entirely new appreciation of life—yes, even—especially—those boring ordinary days! This entry was posted on Thursday, August 26th, 2010 at 1:27 pm and is filed under General, New Books. You can follow any responses to this entry through the RSS 2.0 feed. You can leave a response, or trackback from your own site. I am Rivka Zucker – the author. I am thrilled to finally have my story publicized. If I can inspire and help others from what I went through, it gives meaning to my suffering and makes it worthwhile. Please spread awareness about my book ‘Struggle to the Summit’. I want to reach as many people as possible. Before Pesach, I spoke on the chazak hotline. Also, I appreciate all feedback and comments. My daughter wrote this book, and I recommend it highly because I know very well what my daughter went through. As she worked hard to get better she learned how to cope with her daily routines so she wouldn’t need outside help. She is still working on improvement, and is very inspiring to others with physical challenges.